So, when Jade became pregnant I used it as an excuse to kick the cigs. I started using E-Cigs instead. I have recently teamed up with the guys at Vape Direct to test some of their starter kits and liquids. I was offered a choice of 3 kits. I went for the Trek, mainly due to the style of the design, it stands out as superior when put against other starter kits on the market. The package arrived quickly and soon as I unboxed the product it was clear to see that this was a company aiming to make a great first impression, the product was in it's own foam casing to protect it during transit. Also with many other starter kits on the market you get a battery, mouth piece, coil and tank. Cheap and cheerful. Vape direct however go one better. They provide 2 coils and 2 mouth pieces. A round one and a flat one. 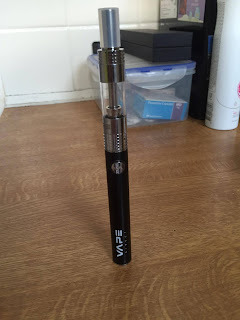 I found the E-cig to be very light and compact which is a huge advantage for someone like me who keeps the device in my pocket most of the day. The physical set up of the device could not be more simple. 3 simple parts that screw together. The device came already screwed together. 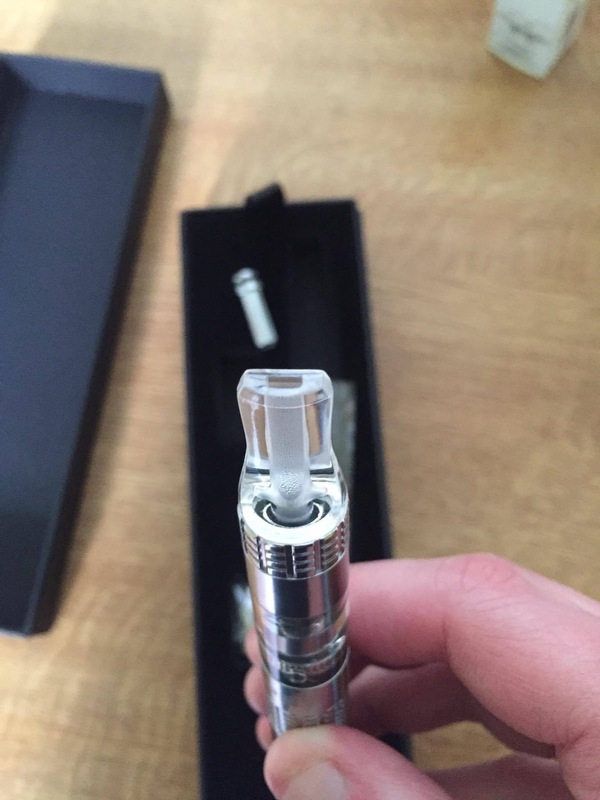 To fill the tank, which is very generous but I will touch on this more later, could not have been simpler, the gap between the air pipe and the chamber is big enough to put the tip of you bottle in and fill up. I was extremely impressed with the time it took to prime the coil. I know many people prime coils in different ways. 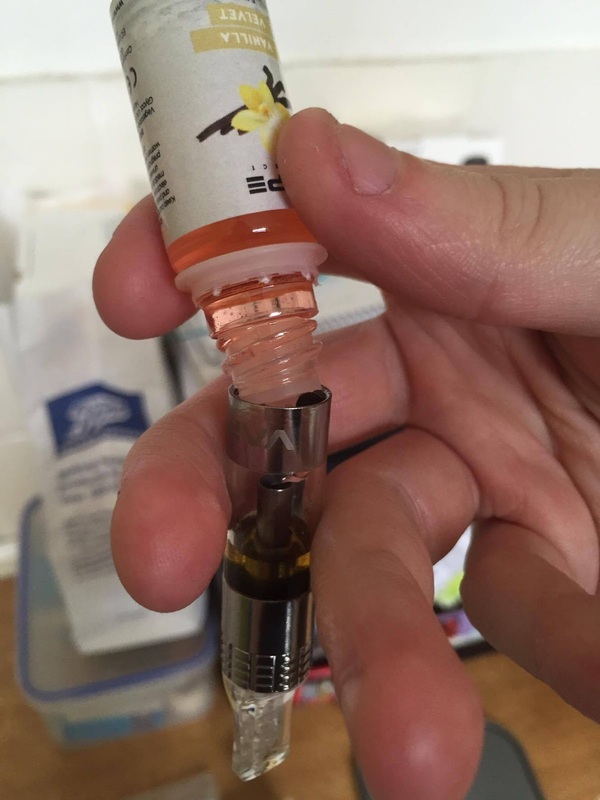 My method is to drip a few drops of liquid into the top of the coil and then a few drops into the holes around the bottom of the coil, screw the tank back onto the e-cig and cover one air hole, drag on the devices without powering it up about 15 times then leave it for 5 minutes or so. I purposely wanted to test how the coil would react to an incorrect or rushed priming process and much to my surprise the coil did not burn out, the flavour of the liquids were still extremely good and the intake was smooth. I only left the coil for 2 minutes without any dry toking. As I touched on previously the tank is actually rather spacious in comparison to other kits at 2ml and the device does not drain the liquid at a quick rate meaning that your liquid last longer and minimises the amount of re-fills. I recently tested how easy it was to change the coil and once again, no issues to report. It was extremely simple and required minimal priming. Now onto the liquid, I chose to test their Black Cherry, Vanilla Velvet and Juicy Apple all in a 6mg (0.6%) of nicotine. At a 80:20 split it is very good for people who want a smooth vape with big clouds. I have tried similar flavours in the past and unfortunately they are always either too overpowering or the flavour is non existent. Vape Direct have managed to find the perfect balance. 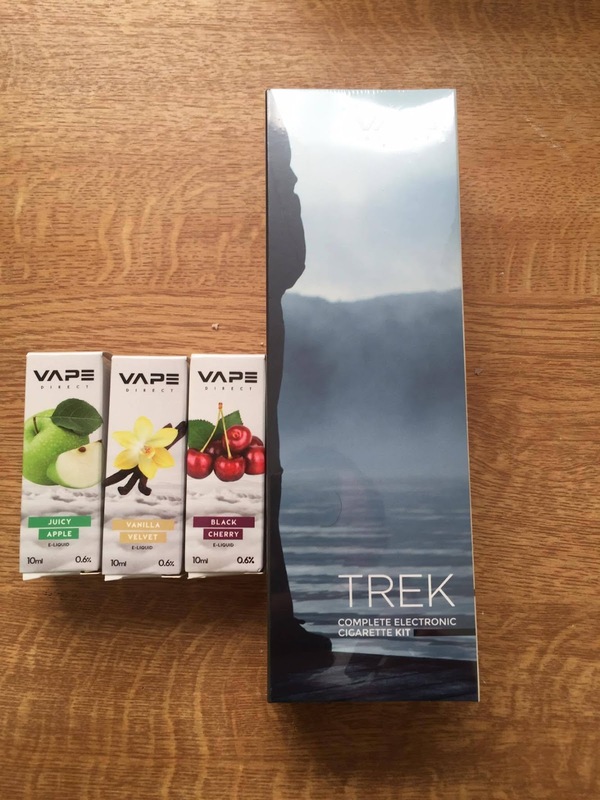 The flavours are well defined and they are quite easily an all day vape. The bottles are child proof meaning no little ones can get into the bottle without pushing down and twisting (a bit like medicine bottles) My personal favourite was the Juicy Apple flavour, The flavour reminded me of biting into a apple on a warm day, that refreshing mouth watering taste you get. Strange I know but it is the only way to describe it really. The black cherry would be ideal for someone who like bitter and dark fruit flavours with the vanilla great for those who have a sweet tooth. 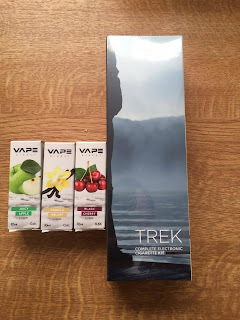 In my honest and unbiased opinion I would recommend Vape Direct and especially the Trek kit to anyone considering kicking the Cigarette habit and joining the Vaping community. They have a wide range of kits and liquids for vapers of all levels from new starters to seasoned veterans. *This product was sent to me for the purpose of this review, this in no way impacts my opinions and all opinions are that of my own.